Just Don't Get Modcon Boiler Pump Charts! Defined in the manual on page 37. Pri/Sec piping..
Manual always rules unless your up for an adventure. "The bitter taste of a poor installation remains much longer than the sweet taste of the lowest price." I was referring to Tom's posting with his oversized Alpine 150.. The 40 rise was also based on design conditions. In either case we would be running 180 supply but my return to my boiler would be 140 and yours 160, The only time your boiler temp rise is going to match the charts is when you need the full out put of the boiler. Yeah, I haven't looked at any of Tom's posts, my analysis is strictly for Ced's system and is most likely not applicable to any other person's. Speaking specifically about Ced's system here. Is my example not correct? For a system that needs a secondary supply of 160 and returns 140 at design, the boiler would be operating at 180/140. Assuming you are enforcing a 40 degree delta across the boiler. Does this look like your system? When you say you want 3.5gpm through the boiler, that's flow 'z' right? --same flow through the pump and 1 inch common pipe, right? I have no idea what I want, other then a pump that will keep the boiler running smoothly. I am going to pipe it directly, no primary/secondary. The boiler chart says I need 3 gallons per minute with a 35 degree delta t, and 5 gallons per minute with a 20 delta t. I started this post to try to understand how one can possibly obtain those temperature differentials with the manufactures provided pump spinning water thru a tiny primary loop at 10 gpm, or so. This still makes no sense. It is impossible to get a delta t of more than a couple of degrees, maybe not even. How much water, GPM, do I have to move thru what is going to be a boiler and the system to keep it running, and not shorten the HX lifespan? Would a variable speed circulator solve all of these problems? The manual does not address this issue to the extent that I can fully comprehend the whole thing. Will the pump flow be less than 3GPM at times because of delta t? And is this okay? I notice that all charts refer to these flow rate a maximum fire, so at minimum fire do we need a lot less flow? Well there, maybe that will clear up my dilemma a bit. DELTA T CHANGES. Flow or gpm is a conveyor belt moving btu/hr. Change delta, change but/hr, but FLOW is the same! SO YOU WILL ALWAYS MOVE the gpm or flow where the pump operates based on the entire system head when piped direct! Varies with firing rate. What's your system head at 3 GPM? I'd probably be looking at an ecocirc e-Series for this. In a perfect world, you'd use a properly sized ∆T-controlled circulator. A Taco HEC-2 (Bumble Bee) is oversized and would be operating at the edge of stability. I don't believe they make a VDT version of the 005.
will always be the same with a fixed speed pump. What I don't understand is whether or not a boiler computer controlled variable speed pump will guarantee enough flow to prevent problems that the boiler maker is trying to guard against wit these minimum flows. Again, in this case, how do I know wether I need 3 GPM or More? They give these delta t numbers in the charts, but they can"t tell me how I can obtain them. Can anyone tell me how, with a primary loop, flowing water at these fast rates, a delta t of 35 degrees be possible? And no, I'm not doing primary/secondary, but the combined boiler system design presents the same problem, but much more doable because at least the building will be taking some of the BTU's. Is a bit below the curve of a 006. Taco makes a 006-VVF4 which the Lochinvar could control via its 0-10V output. Taco, how about some more pump end options for the HEC? edit: While you're at it, give us a 0-10V input along with the internal controls. question- Which is more important, delta T or GPM? 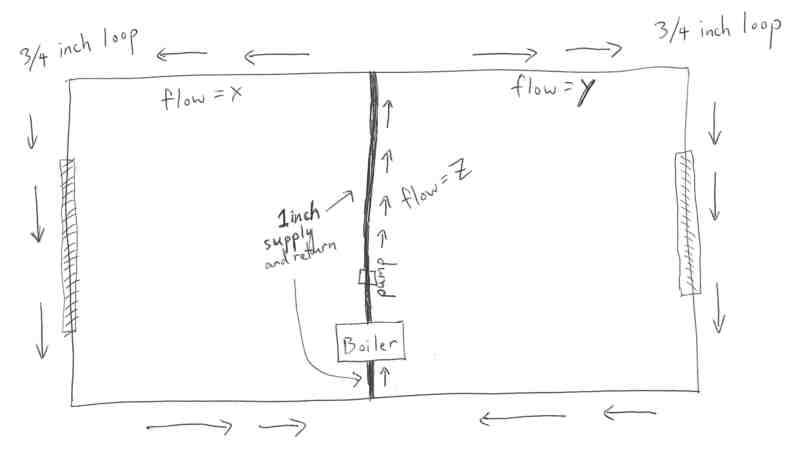 If the delta t is right, does boiler flow matter? SWEI, is there an unsafe minimum variable speed flow on these mod/cons? I mean, can you really have max delta T at minimum modulation using a 0-10volt variable speed pump. Is it wise to allow, say a Lochinvar WHN 55 to modulate the pump all the way down to say: 0.6 gpm at its minimum firing rate of 10,500 btu with a 35 degree delta? I didn't see anything in the manual suggesting this is not acceptable. Will deal with it, including pre- and post-purge cycles. are inexorably intertwined. If either is right, the other will also be. The boiler does not sense or monitor flow, so as long as you stay away from the ∆T alarm threshold it will be happy. These are great questions. I have been wondering myself abut the same ones. If larger primary D/T's like 30-40* are best for efficiency what is the reason for choosing something lower.? is just "they way we've always done it" over here. When you combine that with a generous allowance for idiotic piping, you end up with the manufacturers recommending (or even supplying) pumps which are oversized in about 95% of the installs we see. "question- Which is more important, delta T or GPM? If the delta t is right, does boiler flow matter"
They are one in the same. If you get 35 degrees at full fire, then you can be assured the boiler has the recommended flow at full fire. And that flow rate would be 3.5gpm. If you install the recommended pump though, you will not get 3.5gpm and you will not get a 35 delta T. Remember, the pump recommendations are wrong. They are grossly conservative in case you screw up. Thank you, I see where these gpm numbers on the charts come from, PHEW! But-How can you possibly get a delta T of 20, never mind 35, on a tiny primary boiler loop? They don't make pumps that small. Lochinvar is assuming... let me say that again, they are *assuming,* that the btus the boiler is putting into the primary, are being removed by your system. Simultaneously. 1 btu in, 1 btu out. 35 degree rise at the boiler, 35 degree drop across the fintube. If you just had a primary and no fintube, or no secondary loops, the temperature would immediately fly up to the setpoint and the boiler would shut off. Does this make sense? Lochinvar doesn't know anything about your system side. But they expect you to hook up your new boiler and freshly piped primary to something that is capable of removing the thermal energy (the btus). And you are. "But-How can you possibly get a delta T of 20, never mind 35, on a tiny primary boiler loop? They don't make pumps that small"
Yeah, if you had a pri/sec arrangement, the boiler pump would have to be quite small. That's why SWEI and others ignore the manufacturer and spec their own much smaller pumps. You would have a small pump on the boiler primary loop and a more regular sized one for the system fintube loops. But, you are not doing that. The boiler loop is also the system fintube loop. The pump size required is neither small nor large. You need a regular sized pump. Just get an adjustable pump, not a variable one, but one that can be set to a variety of fixed speeds. The B&G one SWEI recommended. Wilo makes an adjustable one too. All the above are normal sized residential circs. Your system is not unique. It is very small with very little hydraulic resistance. Keep in mind your system runs fine with just one 007. The firetube boiler you want has about the same hydraulic resistance as your current one. Nothing in your system is really going to change much. why they provide the pump they do-they are assuming a delta T as small as 10 degrees. What I am going to do is put a temperature gauge into the system return of the in place system, and confirm the actual delta T, running a Taco 007. This will let me know if I am going to have to make any alterations to the existing piping in order to achieve a low enough delta T. Again, thanks for your help. "And now I know why they provide the pump they do-they are assuming a delta T as small as 10 degrees." Ced, it's not that they are assuming a 10 degree delta. (I hope you don't feel like I'm trying to antagonize you here.) They're assuming that you are going to do all kinds of crazy things with the primary piping. Like 100 foot runs of 1/2 inch pipe. Or 50% glycol concentrations. They are worried that you are going to add a lot of hydraulic resistance and end up with delta Ts of 50 or 60 degrees. would require even less flow, right? You have been convinced by others that 35 degrees is a good starting point. I would not advise that you start there. The advantages of a high delta are most likely not applicable to your specific system. You can adjust the ODR curve to achieve the same effect. System deltas for residential fintube tend to be much lower. For example, taco recommends 10 degrees. I mean, yeah, less flow rate, definitely. But what's wrong with more flow? Are you worried about the head loss and pump requirements? Think about it, let's say your current delta is 10 degrees. And now your new system is 35. Is your house going to heat evenly? The fintube at the end of the loop is 25 degrees cooler than before, or the fintube at the beginning is 25 degrees hotter than before. Something is going change here. Some rooms are going to get hotter or cooler. Are these changes going to be good or bad? delta T, I would have to run 9 GPM or so, thru the boiler, right? Earlier you said your home needs a max of 33,000 btu's per hour right? At full fire you would get a higher delta. But at 33,000, the most your system can utilize, you only need 6.6 gpm to hit a 10 degree delta. The fintube can't dissipate full fire output, and you should just use the electronic settings available on the WH 55 to cap the boiler output at 33,000. To drive this home. If you were to buy a taco bumble and utilize its delta T function, if the pump was set for 10 degrees, then one could expect a flow rate of 6.6gpm when the burner is running at 33,000 btu. When the boiler is modulating at something less, say half (16,500 btus), then the bumblebee would reduce the flow rate to half (3.3gpm) in order to maintain the 10 degree delta. even 6.6 GPM is to much flow for 3/4" baseboard. I am very glad you bring this up. I have been trying for months to point out a mistake you are making in your target flow and head loss analysis. Look at the schematic I drew. The 6gpm flow is in the 1inch common supply and return. In each 3/4 loop, you will only have 3gpm. You have to believe me. It is physically impossible any other way. Can someone else jump in here and confirm???? get back to this area of conversation. I think the flow thru my 3/4"piping will be just a little slower than the 1". You believe it will be 50 percent less. One of us is wrong, the other right. It is simple physics, if there is such a thing. I wish somebody else would help decide this problem we have here. People look at the drawing and tell him! Each side loop is the same. Then: flow x = 3gpm to the left. And: flow y = 3gpm to the right. Then: flow x = 1.75gpm to the left. And: flow y = 1.75gpm to the right. my life will be a whole lot simpler. For once, I hope I'm wrong! The 1" will carry the 6 to the point you want to split it in half. Caleffi Quicksetters would work nice to make sure each loop is seeing the 3. Take another look at my examples an analogies I posted earlier, ced48. What goes into a tee must come out. If you are putting 6gpm into a tee, a total of 6gpm must be coming out. (3+3 going out balances the 6 going in) All Tees are like this, the diameter of the pipe is irrelevant. Class I had in high school. Any books you can suggest or perhaps was Eastman's post edited by Dan, adding the information that wasn't there earlier. Like I said earlier, I'm tickled pink to be wrong. Multi-Temp Multi load Part 2 . It gets Eastman's point across.